Face Painting, Glitter Tatoos, and Balloon Twisting. Brighten up your next event with Professional Face Painting, Glitter Tattoos, and Balloon Twisting to make for a more festive atmosphere. Let us make every child feel genuinely unique and special! 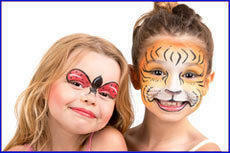 Face Painting is a great addition to any Party, School Carnival, Church or Corporate Event.